Rock formations and the Dedo de Deus (God's Finger) peak in the background, at the Serra dos Órgãos National Park, Rio de Janeiro state, Brazil. English : Rock formations and the Dedo de Deus (God's Finger) peak in the background, at the Serra dos Órgãos National Park, Rio de Janeiro state, Brazil. English : During launch attempt of a Falcon 9 rocket with SpaceX CRS-7, the rocket was seen to disintegrate during first stage flight, it is not known what caused this yet. Front of a giant manta ray (Manta birostris) filter feeding. Raja Ampat, West Papua, Indonesia. 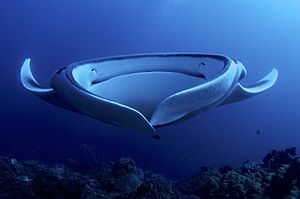 English : Front of a giant manta ray (Manta birostris) filter feeding. Raja Ampat, West Papua, Indonesia. 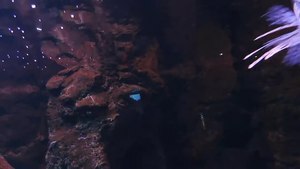 English : Freshwater shrimp (Paratya compressa) filmed in a fish tank in Tokyo, Japan. A view from a ridge between Segla and Hesten, Senja, Norway, 2014 August. The fjord to the right is Mefjorden. English : A view from a ridge between Segla and Hesten, Senja, Norway, 2014 August. The fjord to the right is Mefjorden. English : Example of cleaning symbiosis: Bluestreak cleaner wrasse (Labroides dimidiatus) cleaning the gills of an elongate surgeonfish (Acanthurus mata). Video taken in the Gijon Aquarium, Spain. Young Indian girl from an Adivasi tribe (Bhil), Raisen district, Madhya Pradesh, India. English : Young Indian girl from an Adivasi tribe (Bhil), Raisen district, Madhya Pradesh, India. English : Stone of Tizoc, or Sacrificial Stone is a large, round, carved stone in the Aztec cultural heritage, created in 1480s, and rediscovered on 17 December 1791. It is thought to have been a quauhxicalli, in which the hearts of victims of sacrifice were placed. Located in the National Anthropology Museum, Mexico City. Two Julia Butterflies (Dryas iulia) drinking the tears of turtles in Ecuador. The turtles placidly permit the butterflies to sip from their eyes as they bask on a log. This "tear-feeding" is a phenomenon known as lachryphagy. English : Two Julia Butterflies (Dryas iulia) drinking the tears of turtles in Ecuador. The turtles placidly permit the butterflies to sip from their eyes as they bask on a log. This "tear-feeding" is a phenomenon known as lachryphagy. The Refugio militar Capitán Cobo are barracks used by the Special Operations Command of Spain. They are located at an altitude of 2550 m in the Sierra Nevada mountain range. The road A-395 in front shows the last public section of the 38 km long access road from Granada leading to Pico del Veleta. This is also the highest paved road in Europe. English : The Refugio militar Capitán Cobo are barracks used by the Special Operations Command of Spain. They are located at an altitude of 2550 m in the Sierra Nevada mountain range. The road A-395 in front shows the last public section of the 38 km long access road from Granada leading to Pico del Veleta. This is also the highest paved road in Europe. English : Stack of microscopic images of a rockcress (Arabidopsis) leaf. The small settlement Naajaat in Northwest Greenland, August 9, 2007. The Greenland ice sheet is seen to the upper left. English : The small settlement Naajaat in Northwest Greenland, August 9, 2007. The Greenland ice sheet is seen to the upper left. Tsarevets, a medieval stronghold located on a hill with the same name in Veliko Tarnovo, in northern Bulgaria. English : Tsarevets, a medieval stronghold located on a hill with the same name in Veliko Tarnovo, in northern Bulgaria. English : Vesuvius in eruption, newsreel (1944). Sculptures of the kings of Judea at the west front of Notre-Dame, Paris, France. English : Sculptures of the kings of Judea at the west front of Notre-Dame, Paris, France. English : Astronomers using ESO’s Very Large Telescope (VLT) have detected a stellar-mass black hole much further away than any other previously known. The newly announced black hole lies in a spiral galaxy called NGC 300. This video zooms in onto the position of the system containing the stellar-mass black hole, and finishes with an artist’s impression of the system. Flosagjá canyon, a continental rift between the tectonic plates (North American and Eurasian), Þingvellir National Park, Southern Region, Iceland. English : Flosagjá canyon, a continental rift between the tectonic plates (North American and Eurasian), Þingvellir National Park, Southern Region, Iceland. English : Latte art in practice. English : Demolition of HNA Development Building, city Haikou, provincie Hainan, China, at exactly 10:30, December 25, 2012. Panoramic view of the city of Macau, Portuguese colony until end of 1999, today part of China. English : Panoramic view of the city of Macau, Portuguese colony until end of 1999, today part of China. English : Typical nightly street scene in Las Vegas on the Las Vegas Strip. Musical theatre Buff in Saint Petersburg. English : Musical theatre Buff in Saint Petersburg. English : Angolan giraffe Giraffa camelopardalis in Ljubljana Zoo, Slovenia. Interior of Brixen Cathedral, South Tyrol. The parish is gathered for Sunday worship. English : Interior of Brixen Cathedral, South Tyrol. The parish is gathered for Sunday worship. English : Two old Hurtigruten ships still in active service: "Lofoten" (1964), photographed in Hurtigruten service in 2006 and 2011; "Nordstjernen" (1956), photographed in Hurtigruten service in 2006 and cruising Svalbard (Spitsbergen) in 2007, Norway. English : Pulteney Bridge, Bath, England. English : Time-lapse video of Milky way from Japan with music. Elephant Rock in the cliffs of the island Heimaey, Westman Islands, Suðurland, Iceland. English : Elephant Rock in the cliffs of the island Heimaey, Westman Islands, Suðurland, Iceland. Picked edible fungi in basket. Cep (Boletus edulis, Boletus reticulatus), and Iodine bolete (Boletus impolitus). Trophies of a mushroom hunt. Ukraine. English : Picked edible fungi in basket. Cep (Boletus edulis, Boletus reticulatus), and Iodine bolete (Boletus impolitus). Trophies of a mushroom hunt. Ukraine. English : Western bluebird (Sialia mexicana) in Mather Campground, Grand Canyon National Park, Arizona, USA. Sveti Stefan, a small islet and hotel resort in Montenegro. English : Sveti Stefan, a small islet and hotel resort in Montenegro. English : Zooming in on a rather empty patch of sky in the huge constellation of Hydra. Blue hour shot of the Prince Philip Science Museum, part of the City of Arts and Sciences, Valencia, Spain. The 40,000 m2 museum was opened on November 13th 2000 and was designed by Santiago Calatrava. English : Blue hour shot of the Prince Philip Science Museum, part of the City of Arts and Sciences, Valencia, Spain. The 40,000 m2 museum was opened on November 13th 2000 and was designed by Santiago Calatrava. English : The feeder ship Containerships VIII inbound on the Elbe. View of the City Hall (round building on the left), More London office complex and The Shard skyscraper, at the south bank of the Thames, Southwark district, Central London, England. The City Hall was opened in 2002 and comprises the Mayor of London and the London Assembly. English : View of the City Hall (round building on the left), More London office complex and The Shard skyscraper, at the south bank of the Thames, Southwark district, Central London, England. The City Hall was opened in 2002 and comprises the Mayor of London and the London Assembly. English : Angel and the Badman is a US western movie from 1947 directed by James Edward Grant (copyright not renewed). Evening panorama of Alhambra from Mirador de San Nicolás, Granada, Spain. English : Evening panorama of Alhambra from Mirador de San Nicolás, Granada, Spain. English : View of Berlin (the capital of Germany) from unmanned aerial vehicle (drone). 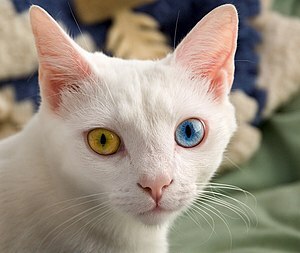 English : White cat with Heterochromia. Rainbow over Gullfoss ("Golden Falls" in Icelandic), a waterfall located in the canyon of the Hvítá river and one of the main attractions of the Golden Circle in southwest of Iceland. The fall step on the left is 11 m high and the one on the right 20 m high. The amount of water flowing is in summer, when the picture was taken, 140 m3/s. English : Rainbow over Gullfoss ("Golden Falls" in Icelandic), a waterfall located in the canyon of the Hvítá river and one of the main attractions of the Golden Circle in southwest of Iceland. The fall step on the left is 11 m high and the one on the right 20 m high. The amount of water flowing is in summer, when the picture was taken, 140 m3/s. English : Chemical reaction called Blue bottle which take place in aqueous solution containing glucose, sodium hydroxide and a methylene blue. Prince Bishop's Castle in Münster, North Rhine-Westphalia, Germany. English : Prince Bishop's Castle in Münster, North Rhine-Westphalia, Germany. English : Interactive architectural visualization (ArchViz) using Unreal Engine 4. English : Origami crane (Orizuru). Seated Golden Buddha from Guhwang-dong, Gyeongju, Korea. English : Seated Golden Buddha from Guhwang-dong, Gyeongju, Korea. English : Rye sourdough starter culture rising (75 grams of 100% rye culture at 100% hydration from 1 minute after mixing for 10 hours, at 1200x speedup). Mottled Bolete (Leccinum variicolor), Ånderdalen, Senja, Norway. English : Mottled Bolete (Leccinum variicolor), Ånderdalen, Senja, Norway. English : Giant woodwasp (Urocerus gigas) oviposits on a cut down pine (Pinus sylvestris). Willem Blaeu's 1635 map of the northeastern part of South America, Lake Parima (Parime Lacus), and the route to El Dorado. English : Willem Blaeu's 1635 map of the northeastern part of South America, Lake Parima (Parime Lacus), and the route to El Dorado. English : Two German Army tanks Leopard 2A5 (393rd Armoured Battalion) demonstrate deep-wading. Lindi Nature Reserve in Estonia. English : Lindi Nature Reserve in Estonia.